In Venus, the North Pole is located on the South Pole and the South pole on the North Pole, this happens because the Venus is tilted 177° against the Sun meanwhile the Earth is tilted 23°. This makes Venus rotates clockwise, unlike the other planets that rotate anti-clockwise. 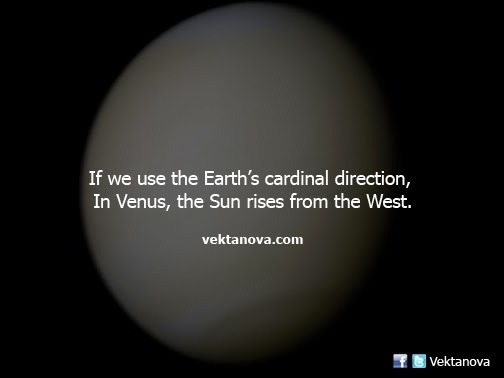 It means the Sun will rise from the West direction of Venus if we use Earth's cardinal direction system. No response yet to "In Venus, the Sun rises from the West"